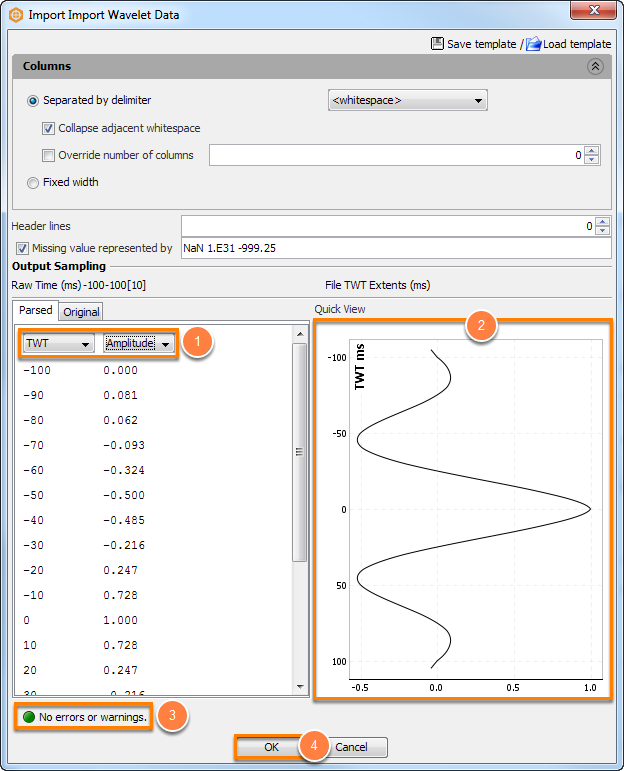 It is possible to load existing wavelets for use in Synthetics, Modeling and Spectra Analysis. Supported file formats of wavelet include .wf, .su, and any text and ascii files (see Using the wavelet text importer below). Open the wavelet file(s). You can open multiple files at the same time. Convert the Coordinate Reference System (CRS) of the wavelet(s) to the project CRS if the wavelet has a different CRS (see Converting CRS When Importing a Wavelet Field). Once you have loaded the wavelet file(s), you can adjust the Frequency (Hz), Phase (°), Scale and Lag (ms) of the wavelets. The wavelet scale should be around 100x the maximum amplitude of the seismic trace for you to view the synthetics. You can further adjust the parameters while doing quality check for synthetics, modeling or spectra analysis. Based on the wavelet file and the defined parameters, the wavelet is displayed in the wavelet preview window. In addition to the standard .wf and .su formats, Insight also allows you to import a wavelet which is saved in a text file. This will bring up the wavelet text file importer. In the Parsed section, define the column headers (TWT or Amplitude) by selecting from the drop-down box. You can view the wavelet in the Quick View section. At the bottom of the text importer, check for errors or warnings. If there are any errors, click on the exclamation icon to display details of the error and resolve it before continuing. The exclamation icon will turn green when there are no errors/warnings. Click OK to import the wavelet.